Recent aircraft ADS-B, VHF ACARS, and HFDL Data received using software available at PlanePlotter. The PC-HFDL software can be downloaded at PC-HFDL. This software uses inputs from several sources. The 1090 MHz ADS-B data is received by a Kinetic SBS-1er. 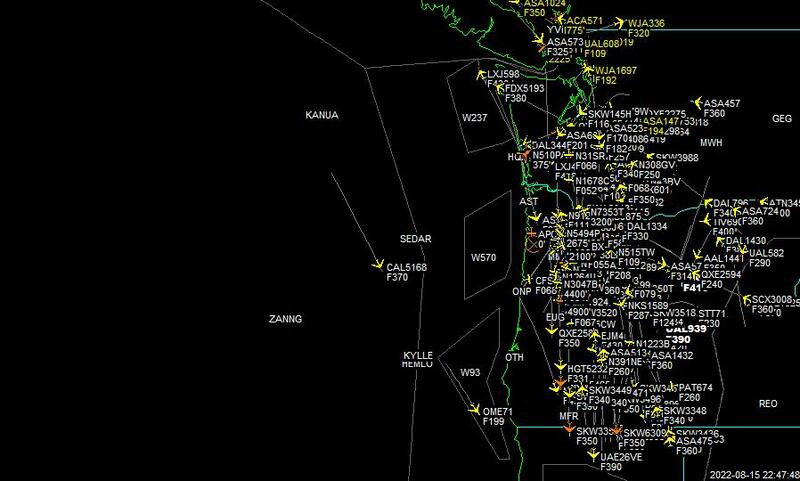 The ACARS data is obtained via a PC sound card fed by a VHF receiver tuned to the ACARS frequency (131.55 MHz AM) and a HF receiver tuned to a San Francisco or Hawaii HFDL frequency (usually 10.081 or 6.559 MHz USB). Click here to return to the OCRG home page. Tracking page using Google Maps. Send comments or suggestions to: Ken, W7KKE. This page should refresh every 60 seconds.